Anyways, St. Jack. Cute little place on a corner. We stepped inside just briefly before being ushered outside to the beautiful spring weather. Still, it had such a great feel. I love when you tell them you have never been and they get so excited they don’t know where to start. You almost feel like you need to order everything, but then you get your head back in the game and settle on favorites. Roasted Beet Salad. Tons of beets!! We slid in just in time for Happy Hour, so we started with a few things there. I enjoyed the Roasted Beet Salad. I love when a beet salad is beets with a little bit of greens. I am always disappointed when it’s the other way around because I LOVE my beets. Mussels from the Happy Hour Menu. Huge serving. 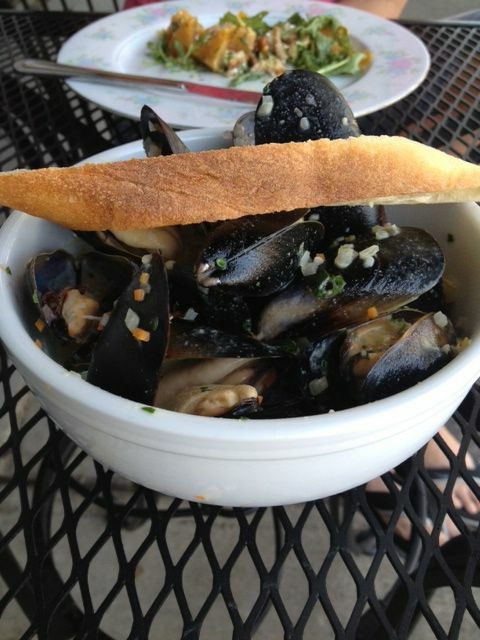 My husband order the Mussels, and it was a rather larger serving. He really enjoyed it and even though that is not my thing, I had a few and I was pleasantly surprised at how amazing and fresh they were. For some weird reason the steak was standing out to both of us. We rarely order steak, mostly because it’s over priced and disappointing. This steak was fabulous. It was a rib eye, so you can’t go wrong there, but the seasoning was perfect. Just enough flavor to make you say “Wow” but not so much you couldn’t taste the meat. And the Pomme Frites were also perfect. 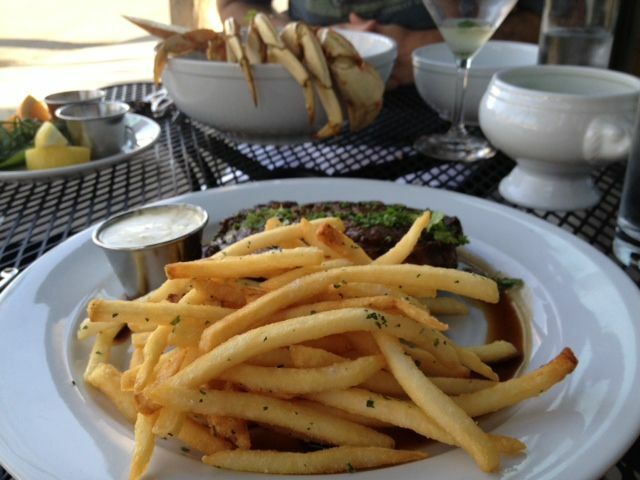 We spent a few years in Europe, so we know good Pomme Frites! I must have been more excited about the Pomme Frites than the Steak. Funny picture, but both were spectacular. 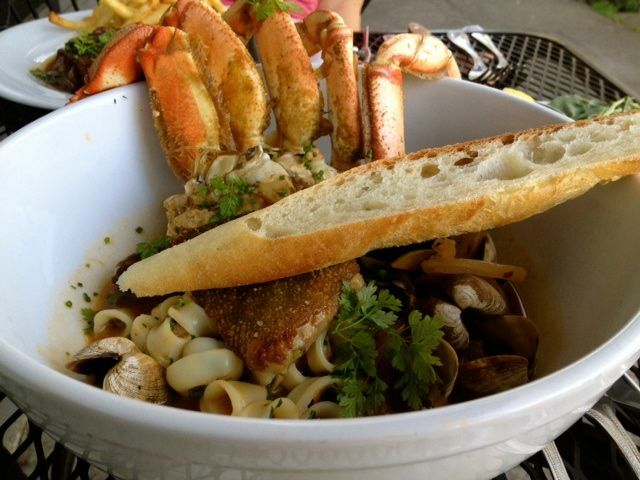 My husband order a seafood dish. I don’t even remember the name of it, and if I did I am sure I would not spell it correctly, but it was a huge bowl of crab, squid, mussels, clams, a white fish(can’t remember what) and octopus all in the broth. Then you could add spice to the broth if you wanted and another aioli type of sauce to change the flavor. Let me just say this was out there for us, and we both enjoyed it. The two dishes were a perfect match. Probably one of the best meals we have had in a while. We will be back. Atmosphere is very charming and romantic and I do love that they have a little bit of outdoor seating. 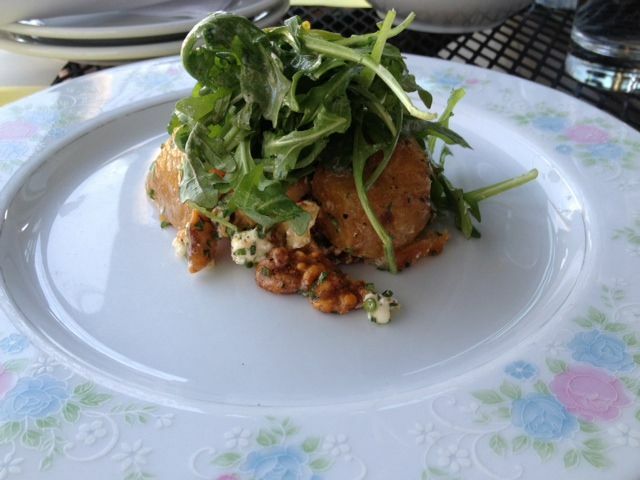 Pricing is a bit on the high side, but the quality of food and the portions make it worth it. Service was beyond amazing. Lots of interaction and help, and kept everything full. I did not check the beers, but they have a great cocktail list and plenty of wine.